While these sites are beautiful , what really stood out for me was the appalling state that they were kept in and the disrespect that was shown to them. Unfortunately it’s no surprise for me to see an Indian monument that isn’t being looked after, but it is the first time I think I’ve seen someone actually make a home for themselves inside one. That’s a cave that’s over 2,000 years old that he’s sleeping in. Worse still, the next cave was inhabited by another man who was calmly lighting up a chillum as I walked past. The entrance to the Khandagiri caves was particularly filthy. And then of course there was the graffiti that marked so many of the caves. Some of these caves have survived since the 1st century BC, but it looks like they will quickly be ruined. The sign at the front of the caves says that these are protected monuments, but it’s quite clear there’s very little protection being offered to them. 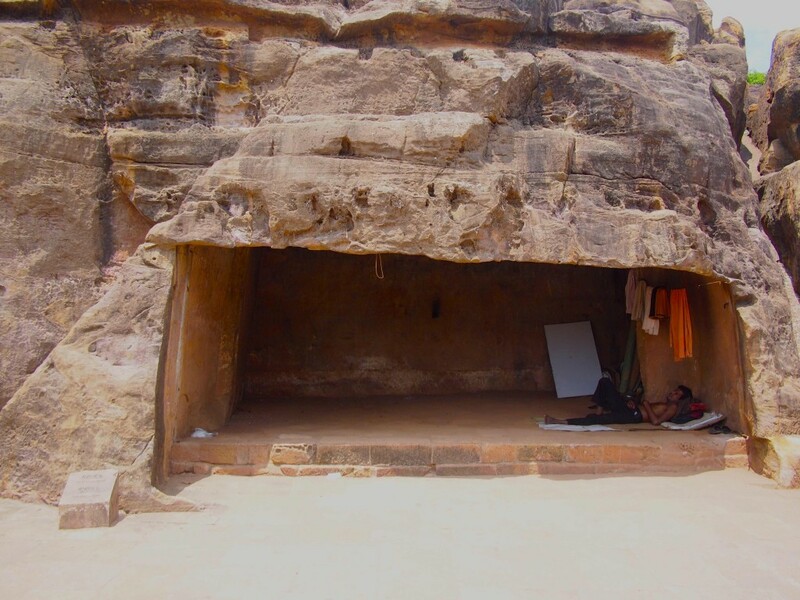 As part of Ekamra Kshetra – the temple city of Bhubaneshwar, the caves are currently being considered for UNESCO World Heritage Listing, but it looks to me like this protection will come too late. It’s not all doom and gloom as the caves do make an interesting site to visit. 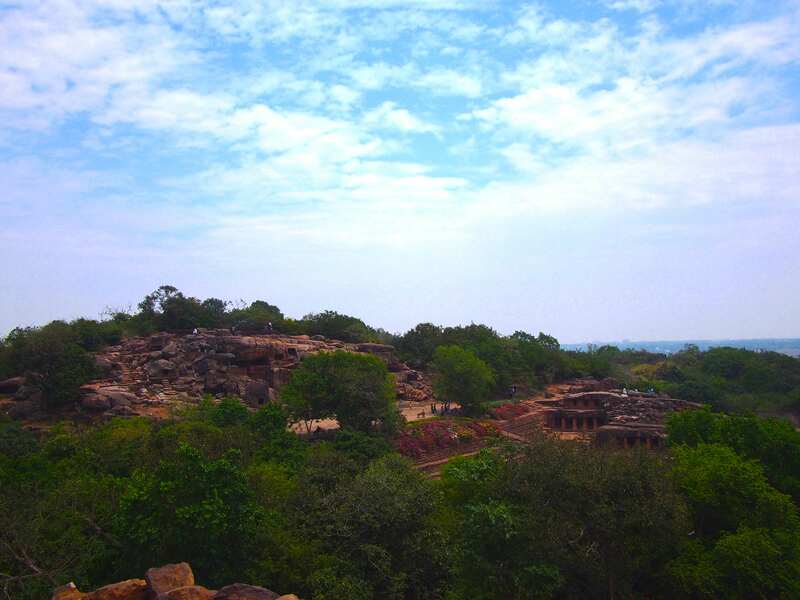 If for nothing else, then at least for this spectacular view of the Udayagiri caves from the Khandagiri caves. Photos just don’t do it justice. Located about 8km from the centre of Bhubaneshwar, these rock-cut caves were created for Jain monks. They were essentially like a multi-storied home for the monks to take refuge in. There are 15 caves at Khandagiri and another 18 at Udayagiri. The two regions are located right next to each other on adjoining hillocks, making them easy to see together. At close range the caves have some spectacular carvings, while much has been weathered over time, you can still catch a glimpse of how incredible this must’ve once been. While there is some restoration work being undertaken at the caves, it tends to detract from the beauty of these handmade caves. I’m not sure if the restoration work is finished, or if there will perhaps be further work to try and make it blend into the remaining structure. Regardless it’s a pity that despite the maintenance work, nothing is being done to stop people from sitting in the caves or touching the carvings. Whenever I see “protected” sites like these around India, I usually leave feeling frustrated and angry, and unfortunately this was no exception. If locals can’t appreciate the beauty and awesome feats of their ancestors enough to respect them, how on earth can they expect anyone else to show due respect to their culture. I wonder whether people will wake up in time to truly protect these marvellous sites across the country before they are forever lost to text books and legends. Nice to see a shot blog by you on Khandagiri/Udyagiri. Like it most that you highlighted the point as to how Indian monuments are neglected by Officials and the locals.